York University administrators say they are ready to return to the bargaining table with the union representing 3,700 of the school’s striking teaching assistants and contract faculty, as a strike enters its third week. “A few minutes ago, the University reached out to the mediator to request that he inform CUPE 3903 that we are prepared to return to the bargaining table on Tuesday, March 20,” university chief spokesperson Barbara Joy said in a news release issued Saturday. 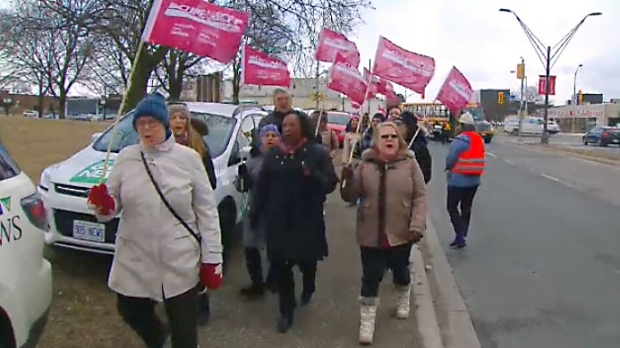 “We want to get a deal and end the strike as quickly as possible so we have some hope that what we’ll see from CUPE is a realistic counter-offer that will lead to an agreement,” Joy told CP24. CUPE 3903 walked off the job March 5 after voting against a proposal from the school that the administration described as its final offer. The union submitted a counter proposal later that day but the school rejected it and bargaining has not yet resumed. The school says about 50 per cent of scheduled classes have been impacted in some way by the strike. Key sticking points in bargaining have been wages and the mandated number of contract faculty who are offered tenure-track positions each year. Joy said the university will “do everything it can” to ensure a deal is reached when bargaining resumes. CUPE 3903 spokesperson Lina Nasr told CP24 that the university “ignored” the union’s two previous counter-proposals to end the strike, but Saturday’s signal is positive nonetheless. Nasr said “red lines” her members have brought up include the exclusion of 700 graduate students from union membership, the precarious nature of work as a contract instructor and new supports for employees who become victims of sexual assault.